(Nanowerk Spotlight) The effluents of tannery, paint, paper and textile industries containing different type of dyes are often discharged untreated into water bodies. The No. 1 polluter (after agriculture) of clean water is the textile industry, one of the most chemically intensive industries on the planet (read more: "Textile dyeing industry an environmental hazard"; pdf). The World Bank estimates that 17 to 20 percent of industrial water pollution comes from textile dyeing and finishing treatment given to fabric. Some 72 toxic chemicals have been identified in water solely from textile dyeing, 30 of which cannot be removed. This causes a serious environmental threat to aquatic and human life. Moreover, water treatment plants are very prone to fouling due to microorganism growth in the contaminated water, resulting in higher energy consumption and operating cost. The development of sustainable, robust, energy-efficient and cost-effective water purification technologies is a challenging task. Conventional practices adopted for water purification – which can be classified into physical, chemical and biological methods – suffer from certain limitations such as high cost, low adsorption capacity, generation of toxic sludge, etc. These technologies – which include coagulation, flocculation, reverse osmosis, membrane separation, oxidation and ozonation, adsorption – are expensive or inadequate to remove dye. Adsorption with activated carbons, which is a cheap and effective method, has been demonstrated to remove dye from wastewater. But this approach is not suitable for industrial wastewater treatment because activated carbon can only be used once and then it is commonly disposed of in landfills. Moreover, removal of pathogens from treated water requires additional processes like chlorination, ozonation, etc., which increases the cost of treatment. A possible solution to tackle this problem has been demonstrated by scientists in India. They developed nanotechnology-based water purification using nano-silica-silver composite material as antifouling, antimicrobial and dye adsorptive material. Using this process, pathogenic bacteria and dye present in contaminated water can be treated simultaneously without using any chemicals, high-temperature, pressure or electricity. 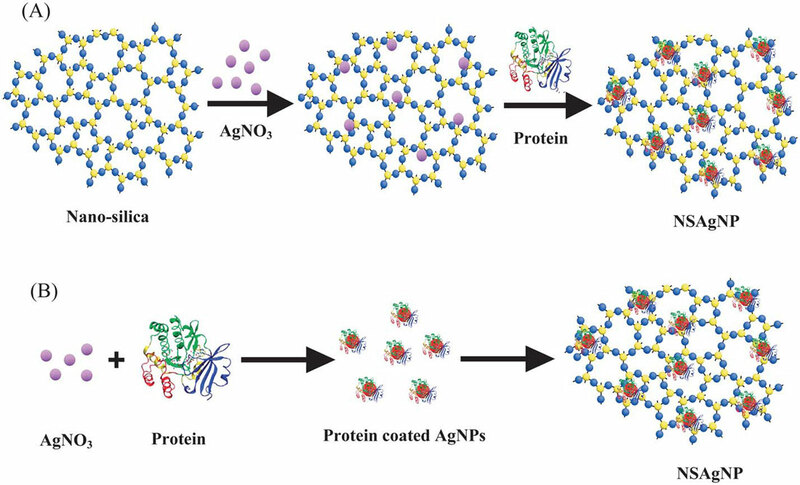 The team reported their findings in Nanoscale ("Nano-silica fabricated with silver nanoparticles: antifouling adsorbent for efficient dye removal, effective water disinfection and biofouling control"). "We synthesized a nanosilica supported silver nanocomposite material through ecofriendly protein mediated reduction of nano-silica bound silver ions," Dr. Sujoy Das from the CSIR-Central Leather Research Institute, India, the paper's first author, explains to Nanowerk. "The proteins, extracted from Rhizopus oryzae - a zygomycetes fungy, served both as a reducing and a protecting agent for the silver nanoparticles and prevented their oxidation under environmental conditions. The result is a low-cost, highly effective nanomaterial for sustainable water purification." The simple, low-temperature bio-synthesis fabrication process – it does not require any elaborate or expensive equipment – works without any chemicals for reduction of silver ions and subsequent production of silver nanoparticles, thus minimizing the environmental load of toxic chemicals during the fabrication of this nanocomposite material. The coating of proteins on the nanoparticles' surface prevents the leaching of silver ions – which in itself could be a source of water contamination – and provides long stability of the nanocomposite. In their report, the research team notes that the as-synthesized nanocomposite demonstrated very high dye removal capacities and exhibited antimicrobial and antifouling properties. The nanocomposite removes the dyes at wide pH, temperature and dye concentration in solution. Moreover, the nanocomposite kills the microorganisms frequently present in the contaminated water. "Most importantly" says Das, "the silver nanocomposite very efficiently removes dyes and pathogenic microorganisms from water bodies in a single-step operation. In addition, the nanocomposite material could be regenerated after treatment of dye bearing wastewater and the regenerated nanocomposite could be stored and reused for several more cycles." Nanosilica has a very high surface to volume ratio and contains a large number of surface hydroxyl groups, which provide electrostatic binding energy for dye molecules on its surface. 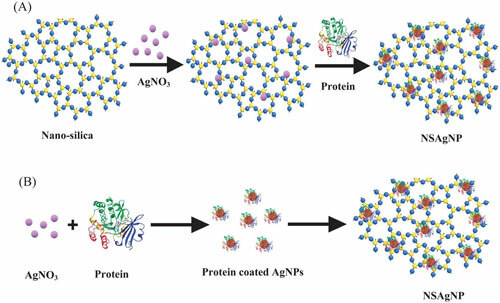 Combining this with the antibacterial activity of the silver nanoparticles on the surface of nano-silica results in a synergistic effect of the nanocomposite, which is responsible for high removal of dyes and microorganisms from contaminated water. The nanocomposite also prevented attachment of floating microorganisms and inhibited the formation of biofilms on its surface. This makes it possible to use it for prolonged times in contaminated water. "We believe that the long term antibacterial, antifouling and high dye adsorption properties of our functional nanomaterial are exceptionally promising for the development of high-efficiency and low cost water purification technologies," concludes Das. After completing their tests, the team is planning to develop a filter for industrial wastewater treatment in larger volume. They also intend to make potable water filters so that people can use it for domestic water purification.